In the previous article, I gave an introduction to cryptology and a demonstration of how ciphers work. I started with the very basic cipher, the Caesar cipher. In this article we will see how Caesar cipher can be improved and are introduced to other ciphers. What makes Caesar cipher vulnerable? The fact that it can be cracked in only 25 attempts at the maximum or even less if you're smart. The polyalphabetic cipher comes to our rescue. In polyalphabetic cipher the key is a word rather than a number (shift amount, as in Caesar cipher). The key should be less than or equal to the plain-text we input. As you can see if the length of text is not the exact multiple of the length of the key we simply use the letters of the key until the input text is completed, like for the last letters (ge) of the message as many letters of key (se) are used. The number under each letter represents its place of occurrence in the English alphabet. Now each letter is shifted by the amount of the letter of key under it. For example, t is shifted by 19 and becomes m, h by 5 and becomes m, i by 3 and becomes l and so on. As you may have judged by now, this cipher is relatively tougher to crack than the Caesar cipher. The poly-alphabetic cipher, though better than Caesar cipher, is very vulnerable because in the end it is a substitution cipher and if the data is more then patterns can be guessed and the encryption can be cracked. The One time pad is also a substitution cipher but it is better than Caesar and the poly-alphabetic cipher in a way that every letter in the input message is shifted by a random amount and hence a key is generated which is equal to the input data. What makes this cipher secure is the randomness. A n letter word in this case can have 26n possible outcomes which for just a six letter word is 308915776 possibilities. This number increases exponentially as the input data size increases. The downside of this cipher however is that it generates a key which is equal to the input data which doubles the amount of data to be handled and transmitted. The ciphers about which we read till now were all substitution ciphers. The next cipher which we're going to read about is a type of symmetric key encryption. Now if we XOR the plain-text with a key we get the cipher-text and XORing the cipher-text again with the key returns the plain-text. Every ASCII alphabet (letters, alphabets, special chars etc.) has a value ranging from 0 to 255 hence every ASCII character can be represented by an 8 bit (1 byte) binary number. 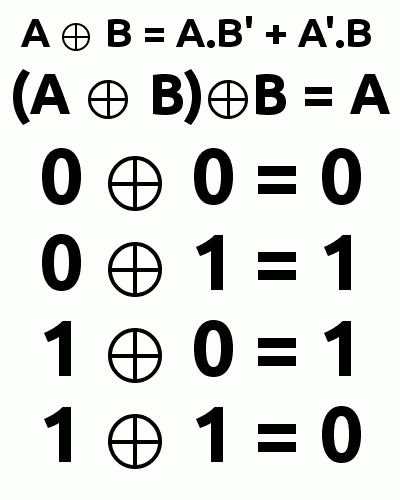 For example, A in ASCII is 65 which will be equal to 01000001 in a 8 bit binary notation. First the input text is converted into binary. Let us take hello as the input text and key as the key. Next, it is checked if the length of the plain-text is an exact multiple of the length of the key. If yes, we proceed to the next step. If no, a number of pad bytes are added to make the plain-text an exact multiple on the key. In our example the length of the key is 3 and the plain-text is 5. Now, 5 is not a multiple of 3 and the next multiple is 6. The difference between 6 and 5 is 1 so we need to add one pad character to make the input an exact multiple of 3. The pad character is a null byte (00000000) i.e. a binary number with all bits 0.
print "The key-length should be less than or equal to the plaintext"